Water Works - Authorized by an act of the Ohio Legislature in 1879 the East Liverpool Water Works was established shortly thereafter. 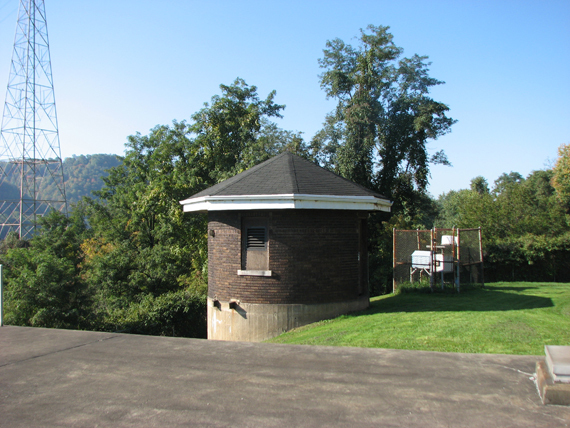 A pump house was erected on the Ohio River shore just above Babb's Island and a large reservoir 350 feet above on Thompson's Hill, built with a capacity of 1,500,000 gallons. 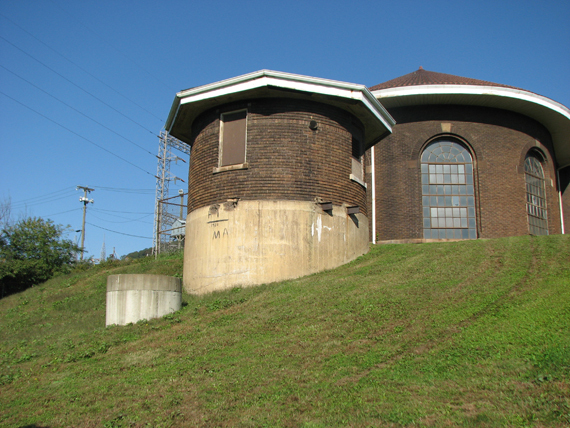 In 1894 a second reservoir on Huston's Hill, 300 feet higher, was erected and a second pumping station was set up midway between them. Then followed the building of a third reservoir in connection with that of No. 1 on Thompson Hill, with a combined capacity of 7,500,000 gallons. The value of the plant in 1905 was $240,000 with a then $140,000 indebtedness. The first Board of Trustees consisted of Josiah Thompson, Isaac W. Knowles and Thomas Arbuckle, with Christian Metsch as clerk. 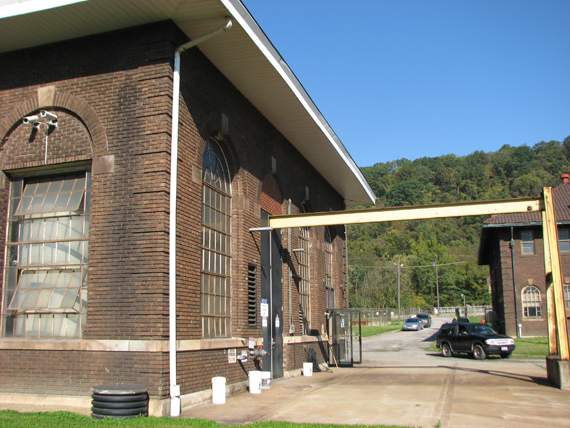 In 1915 a mechanical filtration plant was completed near the Pennsylvania State line at a cost of $565,000. It included a water tower on the hill west of Riverview Cemetery. As a result the two initially used pumping stations were dismanteled. 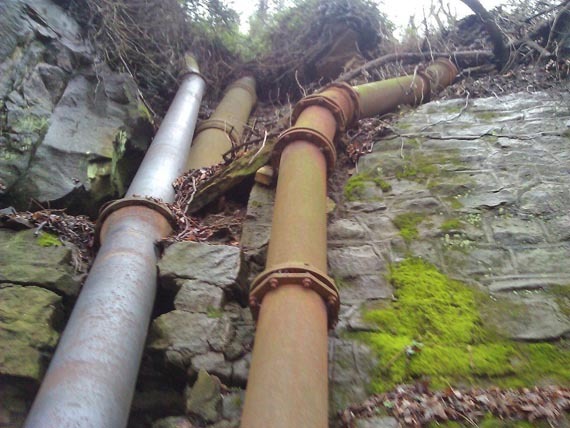 By 1926 there were in use more than 40 miles of water pipes with a daily capacity of 7,000,000 gallons. Agitation for the departure became active during the administration of Mayor Samuel Crawford when efforts were made to sink wells on Babb's Island and other plans considered. 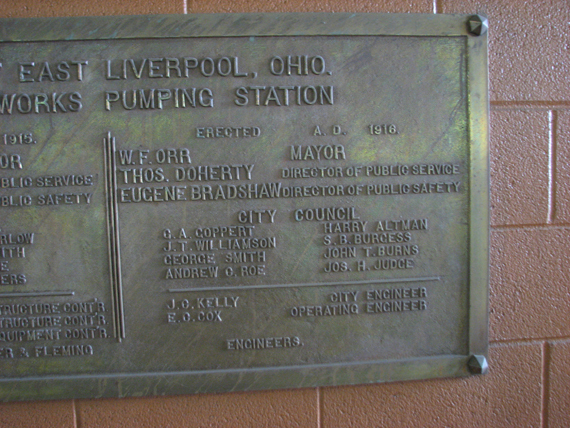 Following an inspection of the mechanical filtration plants in Pittsburg and vicinity by the "Committee of Sixteen" appointed by Mayor R. J. Marshall. In 1912 the plan as at present carried out what was recommended as the most feasible for the city. The City Council then took the necessary steps for proceeding with the project. The first attempt for a universal water supply was the building in 1850 by Josiah Thompson of a reservoir on the east side of Walnut Street a basin of stones 40 by 100 feet and six feet deep which was fed by a strong spring near by. Many of the nearby families frequented the place for their daily supply of water. Another spring was to be found on the top layer of clay that was to be found near the D. E. McNicol Pottery. It was so strong that the plant in that period used it for its water supply. Though the reservoir finally had some homes connected to it with pipes it was in time discontinued by them and turned into a tank for the soaking of hoop poles. In the early days the city depended almost altogether on wells for its water supply. The older inhabitants remember the chief ones which included that one in the middle of Market Street south of the Pennsylvania Railroad and just off the Market Street wharf; another was on the west end of Williams Cask Factory and was probably used to supply the initial pottery of the city which was built by James Bennett and operated by him and his brothers. The Brawdy well about 60 feet back of the southwest corner of Union and Second streets, which was the property of the senior Dr. Ogden, was one of the pioneer watering places as was the Shenkel well on the southwest section of Third and Walnut streets. In later years an epidemic of illness was laid to it and it was condemned and filled. 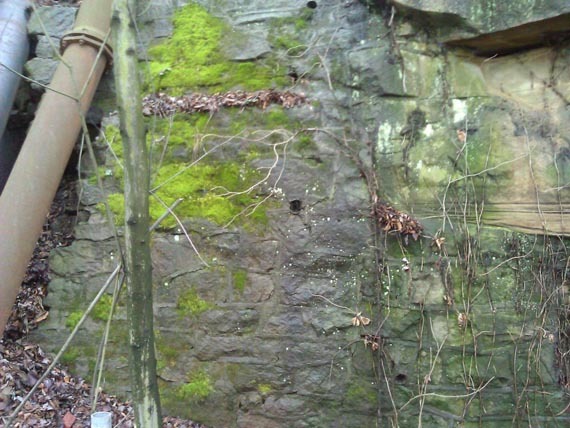 Two springs that were once greatly in use were the Thompson Spring along the railway tracks off the Thompson Pottery and another in a stone house in Thompson Place. The Willets well on Pennsylvania Avenue on the spot now probably occupied by the Okey Heddleston Grocery Store was of great value to the early residents of the city. On south Walnut Street near the home of A. J. Scott, architect, was the Wirth well. On East Sixth Street was the Isaac Knowles well near the old end of the Knowles, Taylor and Knowles Pottery. Across the street from this well was a basin 20 feet in diameter that was fed from a spring which largely contributed to the needs of the plant of the D. E. McNicol Pottery. Just north of Horn Switch was the Mrs. Parriran well on the present Smith Hardware Company site; farther to the west was the John Hardwick well just a few feet north of the Faulk Mill, midway between Green Lane and Dresden Avenue, on the plot that is now used as a freight yard. It was first owned by James McPherson. The John Baum well was situated on the present site of the Crockery City Products Company. Still another was the Wassignaria well on West Fifth Street just off of Persimmon Alley near the home of the late Cornelius Cronin. It was 125 feet deep. Even now a portion of the wall surrounding the home is perhaps slightly sunken because of the presence near it of this one time deep pit. Until it was closed more than a decade ago the Diamond well in the Diamond slaked the thirst of thousands from the several openings through which the sulphur water it supplied was exuded. It gave way to the need for more space for traffic in the Diamond and because a new water system had been arranged for the city, obviating its necessity. For almost similar reasons the Monroe Patterson well, an artesian one, which he had dug in the rear of his home on West Fifth Street and which was reached through an alley was discontinued. For years previous to that, however, it furnished a water supply to hundreds of persons daily. The Following Text is from The City of Hills and Kilns. By 1820, residents could purchase or trade for all the goods and services they required, if not in East Liverpool, then at other locations in the area such as Pittsburgh and Steubenville. On 10 February 1830, John Babb purchased five pounds of coffee for one dollar and tobacco and shaving soap amounting to twenty-five cents from Daniel Culbertson.144 Gardening, daily food shopping and preparation, and retrieving water from wells or the river filled the days of most housewives. While the use of natural gas for fuel and of electricity for heating and lighting was beneficial to most people and was viewed as a symbol of progress, they also contributed to an increased number of fires in the community. For example, on 11 January 1878 John Thomas noted in his diary that Dr. Thompson's house was "blown up" by natural gas. Fire protection in East Liverpool, as in most other nineteenth century communities, developed as a reaction to an increase in fires as the town grew in size, population, and real property. Potteries were especially susceptible to damage or destruction from fires. In March 1876 heat from a kiln set fire to the roof of the new "Dresden" pottery and the Tribune reported that only a driving rain storm kept it from spreading. The editor chided city officials for the lack of adequate fire protection. He stated, "For the protection and safety of our manufactories let us have some feasible means of defending ourselves from the clutches of a gigantic conflagration. Where is the talked of reservoir? Where is the hook and ladder company? Where is the fire engine?" There were continued cries for a fire company in later issues; with new multi-story factories, business establishments and dwellings being built throughout the town more than just a "bucket brigade" was needed. With the editor helping to raise the consciousness of the people, a hook and ladder company was organized in 1877 with about fifty volunteers and Robert Hague as captain. In July 1878 council purchased a hook and ladder wagon from the Caswell Improved Coupling Company.19 The volunteer firemen soon formed an organization and called themselves the Crockery City Fire Department. Once a water works was established in 1879, the city and individual pottery firms put in fire hydrants. . . Despite inconveniences to residents and potters alike, it was the 1874 fire that destroyed W.S. George's cask factory and nearly spread to several potteries that inspired editors of local newspapers to urge council to construct a water works and to sell public bonds in order to achieve the goal. 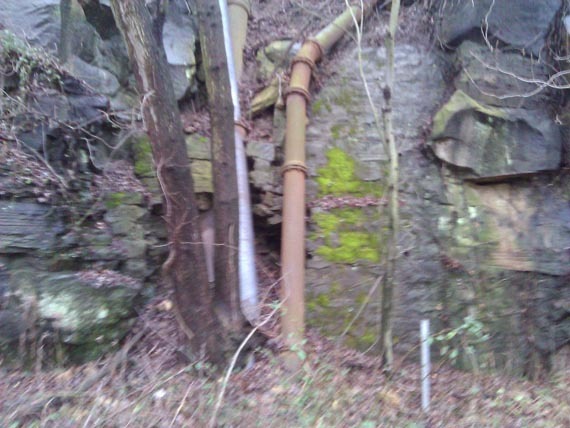 The establishment of a water system in East Liverpool, however, was not without its share of delay and controversy. The initial action taken by officials was in September 1878 when council passed a resolution calling for a special election to vote on the erection of a water works not to exceed thirty thousand dollars. The voters approved this measure by a majority of 450 to 115 votes. A committee composed of Mayor M.H. Foutts, Christian Metsch, and H.R. 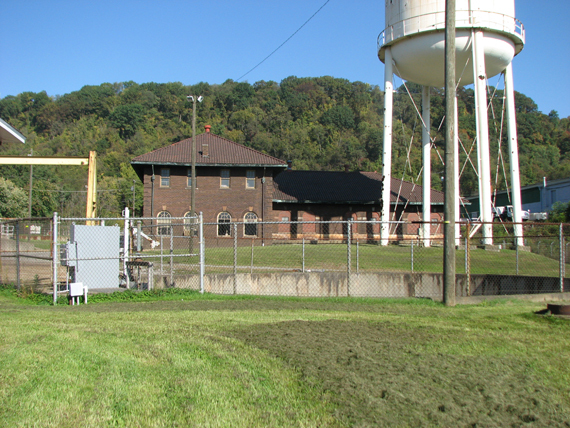 Hill visited the water works in Birmingham and Butler, Pennsylvania in order to determine the best method at the allotted cost. They decided that a reservoir with a pumping station was the most practical method, considering the topography of the town. By June 1879 all of the necessary ordinances were in effect, bonds were issued and sold, trustees of the water works were appointed, specifications and surveys were completed, and bids for construction were solicited. 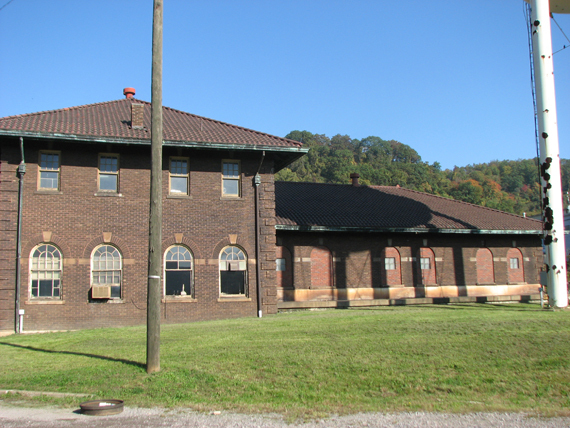 During the summer, the construction of the pumping station on the Ohio River and the million gallon reservoir which was 320 feet above the river on Thompsons Hill, in addition to the laying of pipe, began in earnest. Rates for residential, commercial, and manufacturing customers were established. A dwelling of one to five rooms would pay five dollars per year with an additional charge for private water closets. Saloons were required to pay ten to fifteen dollars a year for the privilege of running water, barber shops paid by the chair, and pottery manufacturers were charged twenty dollars for each thousand gallons consumed. 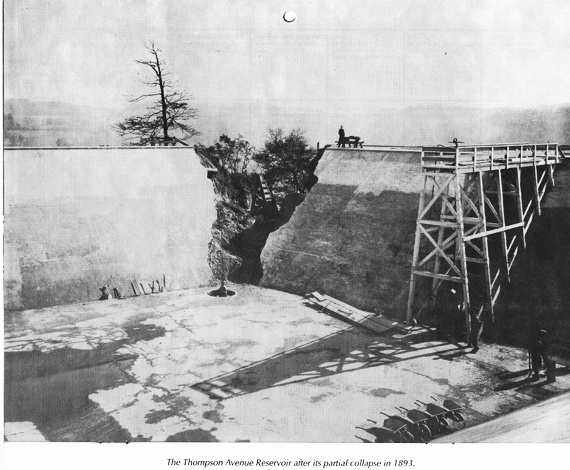 When water was pumped into the reservoir for the first time in November 1879, it did not hold and emergency repairs had to be made. On 5 November 1879 water was released into the main pipes from the reservoir with appropriate ceremony, and the newspaper reported that all the plumbers in the city were busy connecting private customers to the main trunk lines. 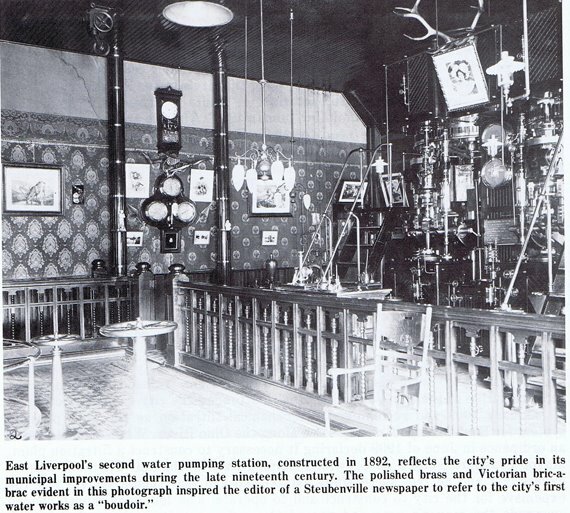 The editor of the Steubenville Herald visited East Liverpool's water works in 1886 and referred to the pumping station as unique. He continued: "The engine room presents more the appearance of a ladies boudoir . . . the floors being covered, walls papered and decorated with pictures and bric-a-brac, curtains and lambrequins at the windows, while fancy tables and easy chairs stood around. The engine stood in the center of the room ... [and] the large amount of brass ornamentation about the engine was polished in the highest degree."